Counter-Depth Refrigerators: Do You Need One? Counter-depth refrigerators give any kitchen a sleek and modern look. These appliances align flush with the counter, rather than jutting out past the edge. But, as attractive as these models can be, they may not be right for everyone. Read on to learn more about whether this type of refrigerator might be a practical addition to your kitchen. How deep are your kitchen countertops? Measuring from the wall, the standard depth is 25 inches, but some homes have different-sized cabinets and countertops, depending on their age and the materials used. It is critical to make sure you get your measurements right when considering these refrigerators, or else you run the risk of ordering an appliance that will not sit flush with your counters. Many refrigerators that are advertised as being counter-depth will not actually fit flush with your counters, even if yours are 25 inches deep. This is because manufacturers use the measurement of the refrigerator box in determining depth, and this figure does not include the doors or the extra space needed for airflow behind the appliance. So the true measurement of a countertop-depth refrigerator will be a few inches larger than the measurement on the box. Counter-depth refrigerators typically have a smaller capacity than traditional models. 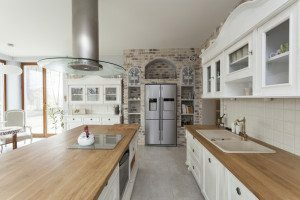 This may turn some people away from this type of refrigerator; however, many homeowners don’t even notice the few inches of space that they lose. These appliances are designed for maximum efficiency and minimal wasted space. Manufacturers use a variety of shelves, drawers and cubbies to provide ample storage for foods and beverages. Larger families may need the extra space that a traditional refrigerator can provide, but for many, the slightly smaller storage area in a counter-depth model may be a fair trade-off for the extra space in the kitchen. Plus it can save energy as well! If a seamless look is most important to you, counter-depth refrigerators will best suit your needs. Some built-in models can even be customized with panels matching your kitchen cabinets. If you don’t want to lose interior storage space, or if these models do not line up with your cabinets, however, a traditional configuration may be best. When shopping for a new refrigerator, don’t forget to consider a few other factors. Do you want a side-by-side model, or would you prefer one with a freezer on the top or the bottom? Do you need an ice or water dispenser? What features interest you? You may decide that you want adjustable shelves, for example, or temperature-controlled drawers. Keep these factors in mind as you are looking at counter-depth refrigerators. Would you like more information on the latest appliances or assistance in choosing the right model to suit your needs? 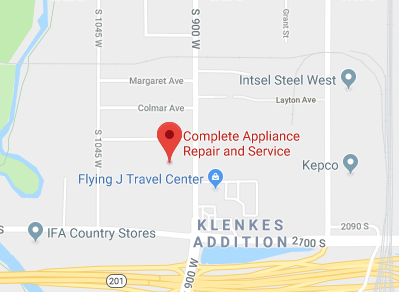 Contact the experienced professionals at Complete Appliance Repair in Salt Lake City. We specialize in personalized service. As a locally owned and operated business, we pride ourselves on helping you find the perfect appliances for you. Give us a call today and allow us to answer all your questions about counter-depth refrigerators. This entry was posted in Blog and tagged Refrigerators on December 21, 2015 by admin.